Zifef u Rwiefen (Breezes and Gales) is now out. It is a collection of 40 poems in Maltese (some in English) written by Patrick Sammut (1968) and Stephen Cachia (1976). The two poets write about a number of themes such as war, love, social problems, the self and natural environment. The book has a critical introduction written by Dr. Charles Briffa (Univ. of Malta) and a comment by journalist and poet Charles Flores. It also has a set of beautiful and strong sketches drawn by the late Norwegian artist and teacher Olaug Vethal (to whom the book is dedicated). The cover was designed by young artist and art teacher Hilary Spiteri. Patrick Sammut, Stephen Cachia, Hilary Spiteri and Olaug Vethal are all teachers at the De La Salle College in Cottonera, Malta. "I have been savouring your poems slowly too, because unlike stories I like to read one poem and then read it over and over. I read your poem Addio Sigar, and I could clearly picture the garden you meant with its almond tree and the little boy climbing a wall to look inside. I find I need to think over some of the maltese words as many of them are new to me even though I speak it well but language evolves through time and mine hasn't evolved as fast. 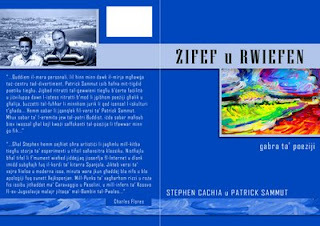 Your poetry and that of your friend Stephen Cachia is very much like contemporary Australian poetry dealing with today's issues, I think it is a breath of fresh air to read this kind of Maltese poetry." "... re. your poem Selmun. I found it very moving! It took me straight to that place most beloved by my father who when he was young used to go trapping birds, with his own father and bachelor brothers (his brothers were too busy having a good time to get involved with begetting children and trying and feed them ) your imagery is beautiful. Keep on weaving words."